Are you kidding, Sam-I-Am? Most readers would jump at the chance to taste some of the delicious-sounding treats described between the covers of a book. In order to keep readers from ruining their favorite books by drooling over fictitious food, here are some recipes for snacks straight out of well loved literature. Plan to spend a day with your friends and a well stocked kitchen, and get ready to make food that you’ve only read about before. Just remember to save some to munch on the next time you open your favorite book! 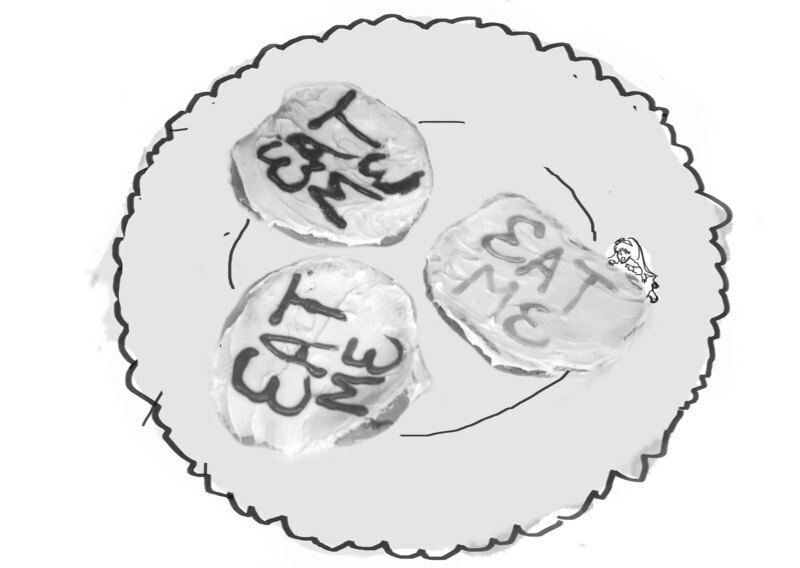 Although they won’t make you magically grow or shrink, these cookies are great to eat while following Alice’s adventures, and they are far better than mock turtle soup. If you’re a cookie purist, you can, of course, make your own dough, but it’s easier to use a store-bought tube of cookie dough to make these delicious cookies. Just slice the tube into cookies, bake, and after waiting for the cookies to cool, cover them with a thin layer of the white vanilla icing. Pick out a colored tube of icing with a special narrowed tip for writing, and write “EAT ME” in multicolored letters on each cookie. Travel to Avonlea with these delicious plum puffs. They are Anne’s adopted mother Marilla’s specialty, and she promises that they make everything better. Preheat oven to 375 °F and cover a baking sheet with parchment paper. Sprinkle flour over a clean countertop or table and roll out the pastry to about 1/8 inch thick and cut it into six-inch squares. Put the squares on the baking sheet and freeze them for about five minutes. Toss the plum wedges in a bowl with the sugar, cornstarch, and cardamom, and mix well. Then spoon a helping of this mixture into the center of each pastry square. Take the corners of a square and pinch them together to seal the mixture inside. Do this for all of the pastries, and then pinch the seams closed at the bottom of the pastries while leaving some space open near the top. Bake for about 25 minutes. More than one reader groaned inwardly when a misguided house-elf caused Aunt Petunia’s delicious-sounding violet pudding to tip over onto the floor. Now you can make the pudding yourself, but make sure you first give some laundry to any house elves that might be hiding around your room. First make the pudding, adjusting the amount you use depending on the number of people you’re serving, but feel free to make a lot because this treat keeps well. Follow the directions on the label, and then add the purple food dye until it’s just the right shade of violet. Pour the pudding into a bowl and layer the top with thick slices of bananas, followed by thin slices of strawberries. Squirt the whipped cream liberally on top — make a mountain if you feel like it — and then sprinkle the blueberries on top of this Mt. Everest of sugar and decorate with the sugared flowers. These are just a few of the many delicious recipes mentioned in books. If you’re still feeling hungry after trying these treats, attempt making some pasta puttanesca from A Series of Unfortunate Events: The Bad Beginning, rout cake from Emma, or rice pudding from A Winter’s Tale. Have fun eating, reading, or doing both at the same time!